Classic sterling silver jewelry is always in fashion and our silver bead jewelry is no exception. 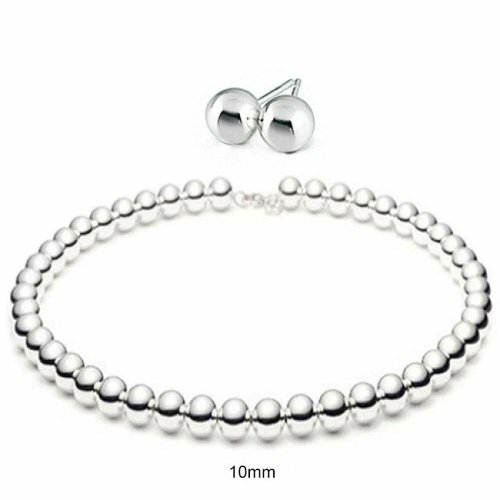 Our sterling beaded necklace and earrings feature a solid, shiny bead necklace with a highly polished finish that is made with 10mm sized hollow balls of .925 sterling silver. The matching earrings range in size between 8mm and 10mm and help to finish off a lovely, classic look in style. Without a doubt, this essential accessory is guaranteed to enhance your look and draw many compliments from your friends. It will look just as good when you are wearing it with your favorite jeans and tee shirt as it will with a simple black dress. Order your silver bead jewelry set today.